ACTING Prime Minister Mariano Rajoy has accepted Ciudadanos’ six conditions for support in his bid to retain his government position. 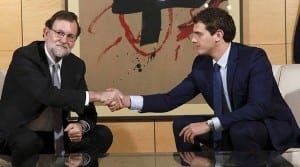 Negotiations between the PP and Ciudadanos will now take place tomorrow with Albert Rivera’s party likely to back Rajoy at an upcoming investiture vote. 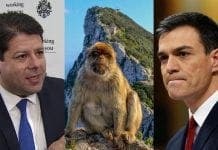 Rivera outlined six anti-corruption measures that he wanted the PP to put in place before he would agree to support Rajoy. “I have asked him to sign the anti-corruption pact and he assured me he would sign it,” Rivera said after meeting with Rajoy. But even with the support of Ciudadanos, the PP candidate will still not have enough seats for a majority vote. Leader of the PSOE Pedro Sánchez has so far been unwilling to either support Rajoy in an investiture vote or abstain in the second round of voting. However, Rivera is confident that this move will be enough to avoid a third election. 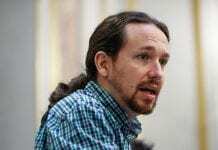 “At least this clears a path, a blocked one, the only one possible, so that we can all forget about third elections,” the Ciudadanos leader said. “It’s the time for negotiation, to talk about Spaniards and their problems. “Being useful is much more important that believing that you are important,” he said.” If there are any politicians who are banking on a third general election, I want to say that they must banish that from their minds. So, business as usual? Confidence-boosting, innit?